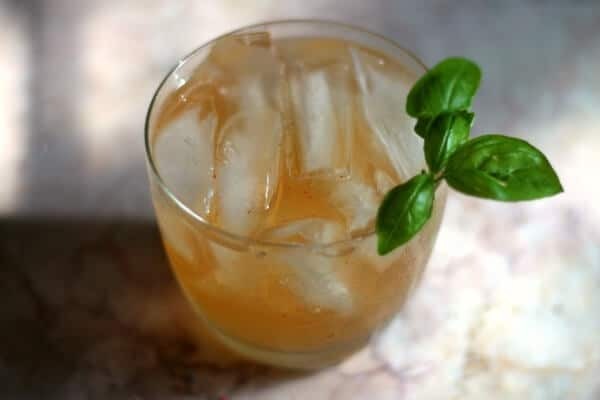 The classic gin and tonic cocktail is an iconic summer refresher. For the summer holidays add some color with colorful stripes of slushy G & T flavored with lime, grenadine and blue curacao. It’s easy to do, unique, and delicious. This won’t work well for an easy pitcher drink but they can be made ahead of time. I’ll tell you about that a little later. Gin and tonics remind me of my dad. When he was working on the house or yard he had an ice cold beer but when it was time for him to relax by the pool you’d find a tall gin and tonic cocktail by his side. When was a teen it was legal for 18 year olds to drink and the second cocktail I ordered on my birthday was… yep… a gin and tonic. Later I tried a vodka tonic and that became my personal favorite. Growing up we had a pool and my parents did a lot of entertaining Mad Men style. It was the mid 1960s and Saturday night gin rummy, Michigan rummy, and poker games were a fact of life. During the summer Saturdays were full of pool parties and cookouts in addition to the cards. There were three other couples in the group but we were the only ones with a pool so the gatherings were most often at our house. Every year my parents threw a big Fourth of July party that had a different theme each year. The best one was Christmas in July. My parents strung Christmas lights through the landscaping around the pool, bought presents for the guests and wrapped them in Christmas paper. Just before all the fireworks started going off “Santa” showed up and handed out presents. It was great! I will probably never achieve the level of entertaining that my mom did but I do enjoy having friends and family over and serving them drinks and yummy snacks. I don’t always have time to do it up fancy but you know, it doesn’t take much sometimes. 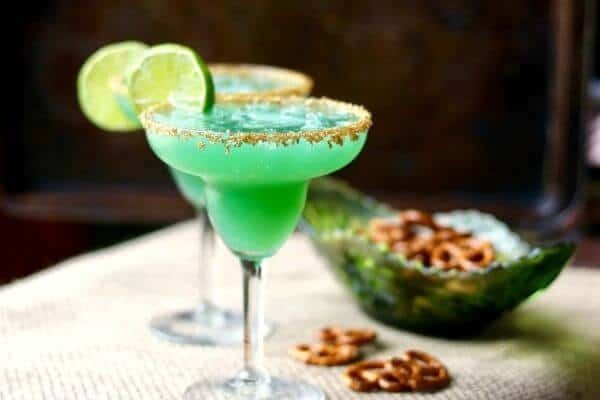 These drinks are so pretty you really don’t need much else to make it a real party. What Is a Gin and Tonic? Basically it’s a highball cocktail that, at is simplest, is make with gin and tonic water over ice. The usual garnish is a slice of lime but other garnishes such as lemon or orange show up, too. A gin and tonic is a highball cocktail made with gin and tonic water optionally poured over ice. It is usually garnished with a slice or wedge of lime. It was introduced in the 1700s by the army of the British Easy India Company to help combat malaria in India and other tropical regions. Since quinine was used to prevent and treat malaria it was added to gin to help dilute the bitter taste of the quinine. It’s no longer a medicinal necessity so the amount of gin can vary according to taste – most often a ratio of 1:1 and 1:3 to tonic water. Since this is a simple cocktail it’s important to use high quality ingredients. Use good tonic water! I like Fever Tree. The layers work best of they are very slushy. 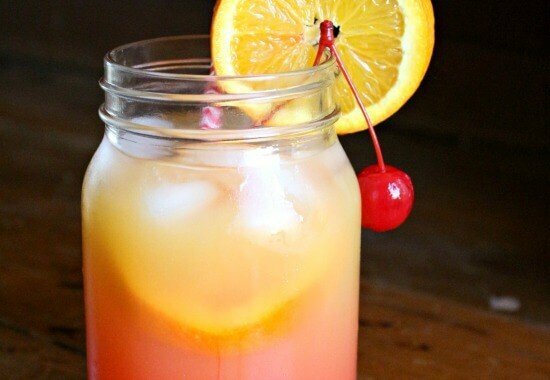 You can make several of these ahead of time in a jelly jar and screw on the top then store in the freezer. The alcohol will keep them from freezing solid. If you want more color use a little food color. Cherries and blueberries are both good garnishes. The cherries will look better if you sprinkle the sugar on top rather than rolling in the sugar. Chilling the glasses before filling them keeps them slushy. Tonic water can really vary from brand to brand. Don’t just get the grocery store kind but try several different ones until you find the one you like the best. You may also like my vanilla gin and tonic version! 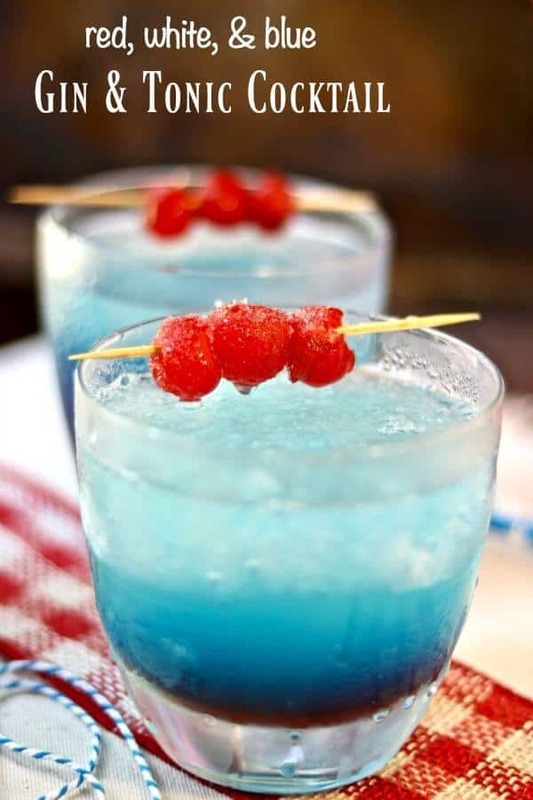 If you love this cocktail please give it 5 stars! This classic gin and tonic cocktail is so simple. 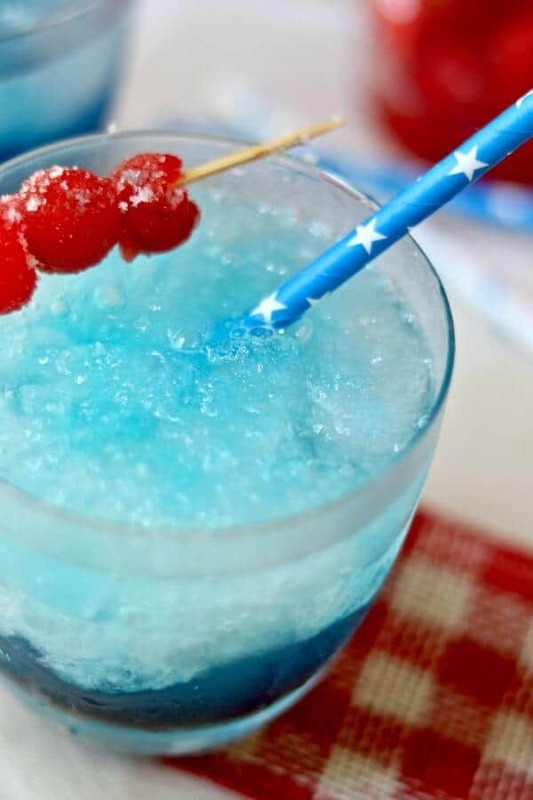 Be sure to use the best ingredients you can afford for the best flavor– this slushy beverage is full of the gorgeous red, white, and blue color. Mix the gin, lime, tonic water, and ice in a blender. Add the grenadine to the bottom of a chilled glass. Spoon in the slushy tonic water carefully. Float the blue curacao on top. Put 3 cherries on a toothpick or small skewer. « Easy Crockpot Meatballs: No Pre-cooking! !